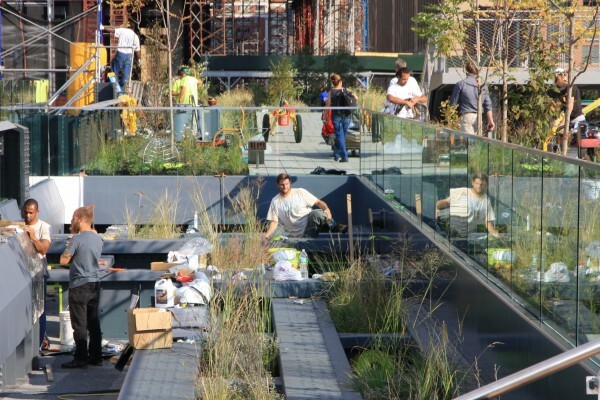 Is the iconic High Line Park being loved to death? The High Line Park transformed Manhattan’s Meatpacking district in its first two phases. Now as its last stretch wraps the massive Hudson Yards megadevelopment, the city around the High Line is transforming the park. The High Line was the first American park to go viral. The romance of a wild garden perched big above the streets and slicing through city blocks caught the world’s imagination, and it can seem that the world is trudging the elegant concrete planks on a nice day. I’m tempted to say it is being loved to death, but I can enjoy the shambling herd by slowing down my speeding Manhattan mental clock. After the enormous success of the first phase, developers swarmed, hoping to cash in on the cachet of proximity to the park. A cluster of big-name condos (Jean Nouvel, Shigeru Ban) along with Frank Gehry’s IAC huddle along the river. Neil Denari’s striking HL23 shimmies around a notch in the park’s steel viaduct. Grandfathered zoning permitted the beefy Standard Hotel to defiantly straddle it. 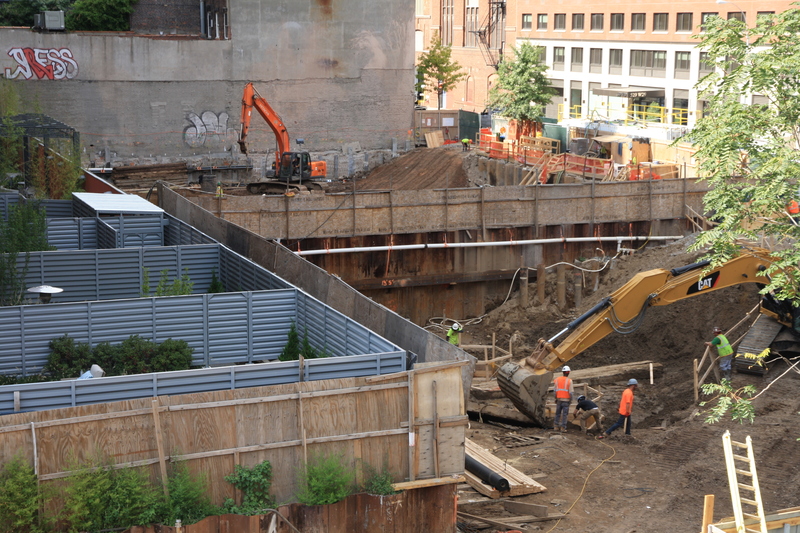 As the High Line moved north of 20th Street, though, the bottom-feeders moved in, throwing up the oversized, under-designed cookie-cutter junk they would drop just about anywhere. Trying to bathe in the High Line’s reflected glory has not inspired the making of architecture to match. 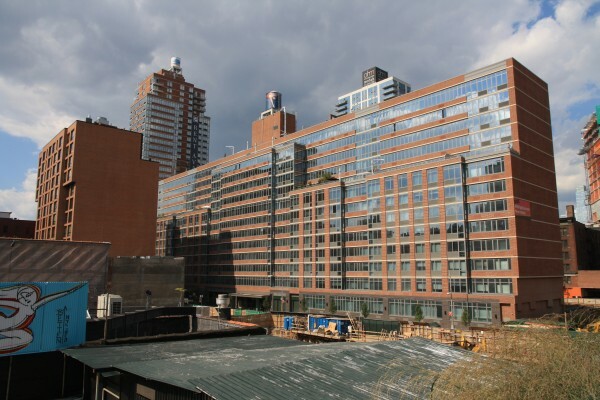 The Related Companies, the development giant that says it wants its Hudson Yards to compete with the best globally, has settled for a predictable orange-brick behemoth that looms 30-some stories over the High Line (above). 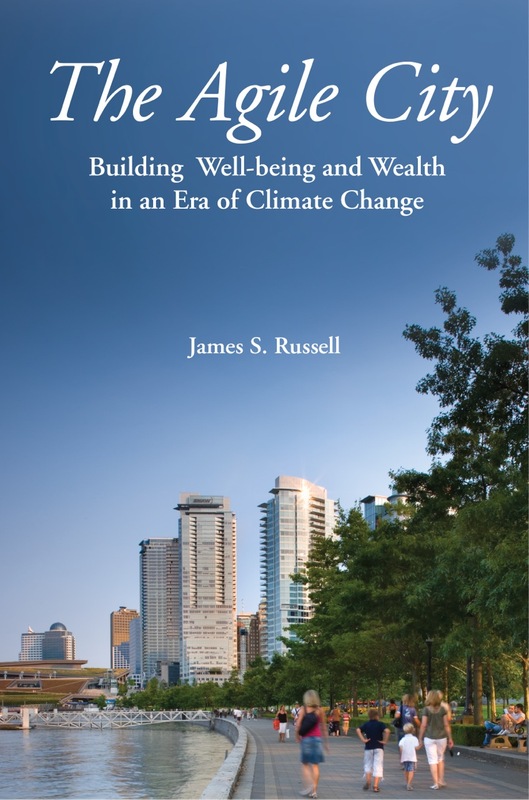 It would be sneered at in places that actually think architecture is meaningful. The Ava High Line inflicted by Avalon Bay. 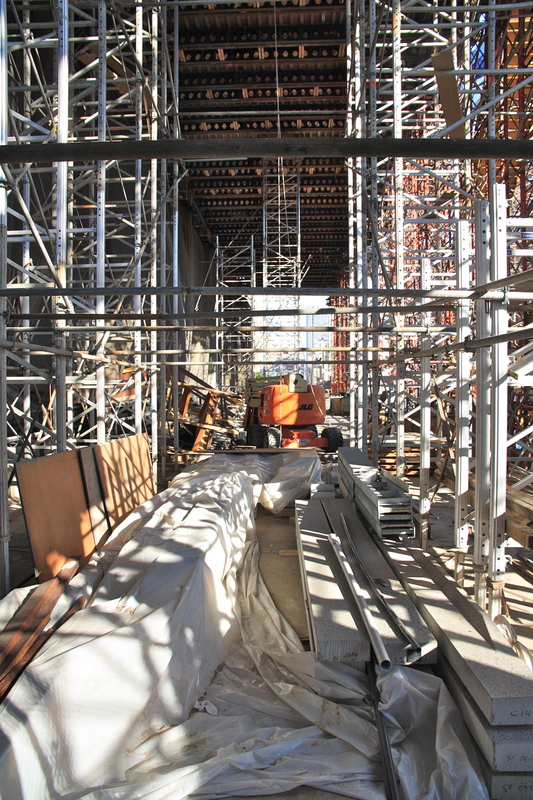 The “Ava High Line” stamped-out by the assembly-line firm SLCE and developed by Avalon Bay, a company that’s never seen a site it could not ruin, is all too typical. There’s more on the way, unfortunately, as you can see by the excavation below. The High Line designers have debated the degree to which the park must respond to the canyon that’s forming around it, but ultimately concluded to tune plantings to the gathering shadows and “keep eyes low,” as architect Elizabeth Diller put it on a preview walk. That entailed abandoning some dramatically sculptural appendages proposed early on, which may have read as far too mannered by now anyway. “Whatever happens above, happens,” she added. 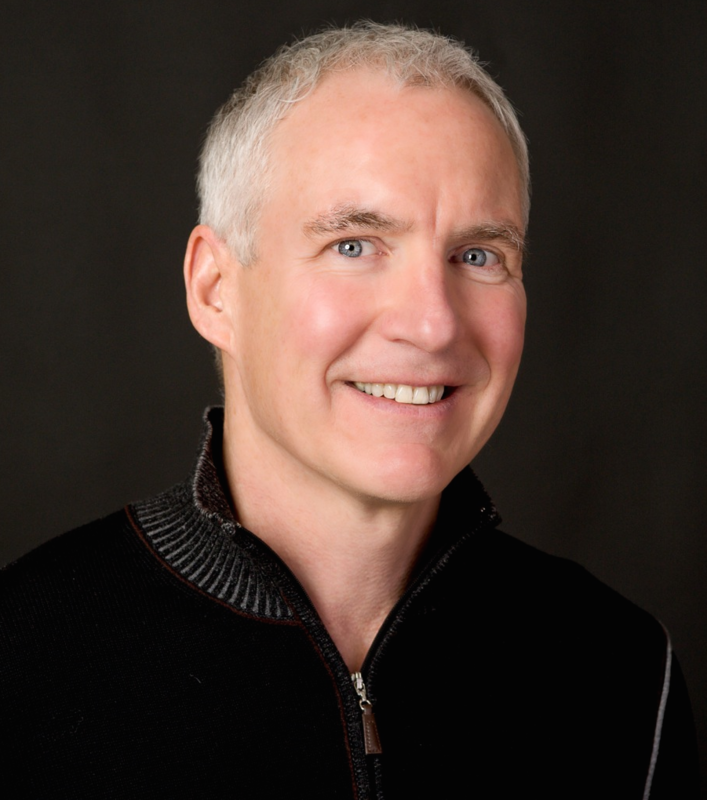 Her firm, Diller Scofidio & Renfro, has worked with the lead landscape architect, James Corner Field Operations, since the first phase. 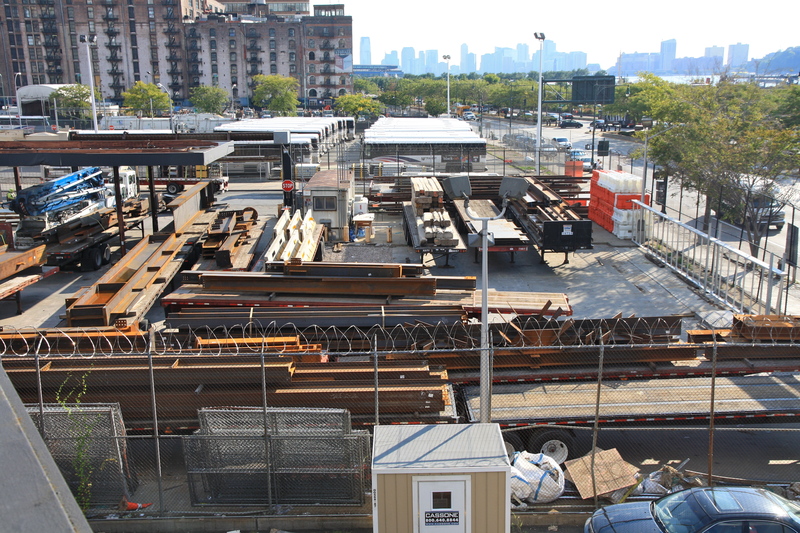 The third phase, which takes a loop around the massive Amtrak and Long Island railyards before descending to ground at 34th Street and 11th Avenue opened Sept. 21, but only a small stretch takes its final form. 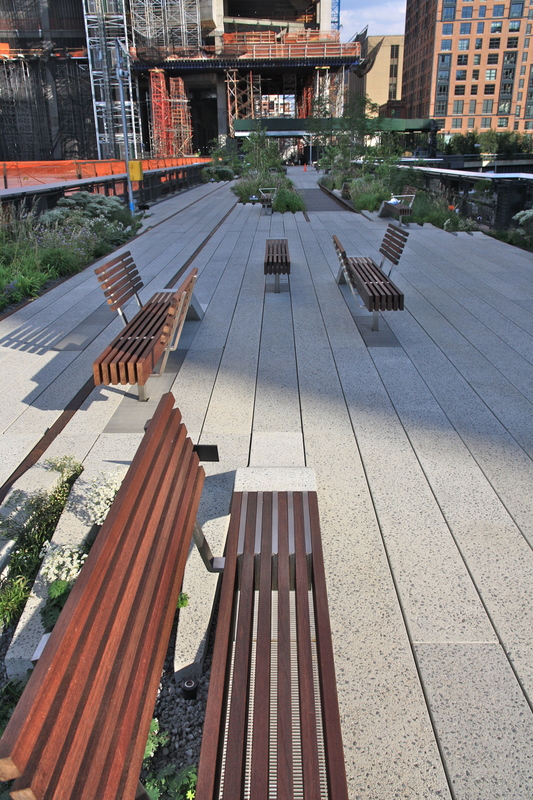 Plank/benches along the High Line Park’s third phase. As the path curves west, aiming at an unimpeded view of the Hudson River, visitors will find a great deal more concrete planking and a lot less of the rampaging grasses, shrubs and trees that swaddle visitors in the parks’ older stretches. (You get a sense of how much the plantings have grown by comparing the top two images.) 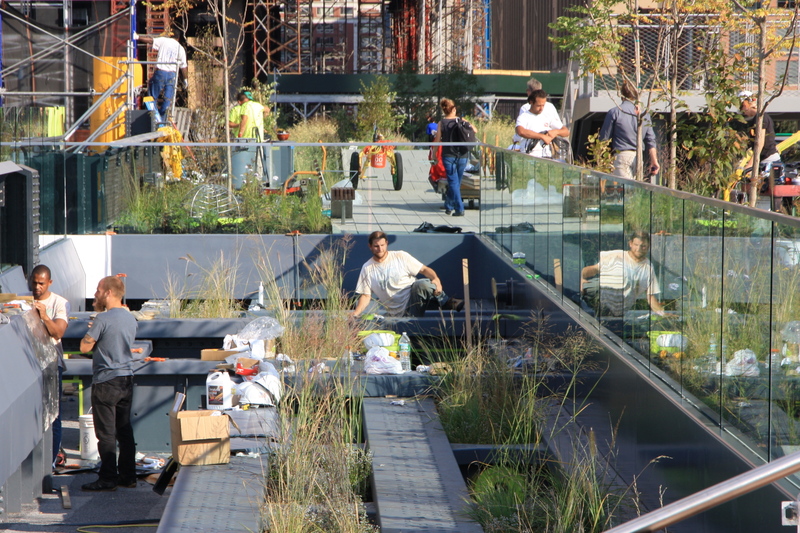 The wild-garden inspiration for the High Line hasn’t been banished, according to Isabel Castilla, who managed the project for Field Operations. Trees and grasses must make way for a confluence of many entrances, she explained. A Hudson Yards multi-story shopping mall and a plaza with a monumental artwork by Thomas Heatherwick of London will pour visitors onto the High Line in a few years. A 30th Street High Line stub will bring more people west from 11th Avenue under the massive pylons (now a Piranesian fretwork of scaffolding) of the development’s first skyscraper (designed by KPF). The 30th Street “stub” of the High Line Park. The planks that wittily bend up to form benches proliferate in number and variety, a subtle change by the designers that recognizes the High Line as a destination as well as a promenade. For noshing, find the picnic-table variation, for schmoozing (and more) the love-seat variation. Long benches accommodate groups. The design introduces a couple of other subtle twists to the plank-and-planting palette. The planks dive under stretches of railroad track that sate the inevitable desire to wobble along a rail. The surface peels away to invite children to crawl amidst massive supporting beams sprouting grasses and covered with resilient material. 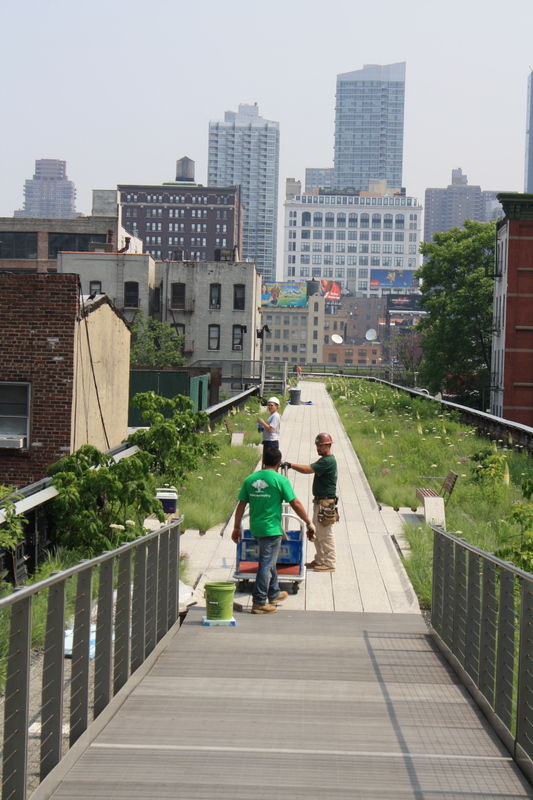 A children’s play area receives finishing touches along the High Line Park. Assuming it can find a reason to exist and enough money, The Culture Shed, a massive event pavilion mounted on rolling tracks, will stretch for 300 feet along the westbound alignment of the park. (It’s design is by DS&R.) 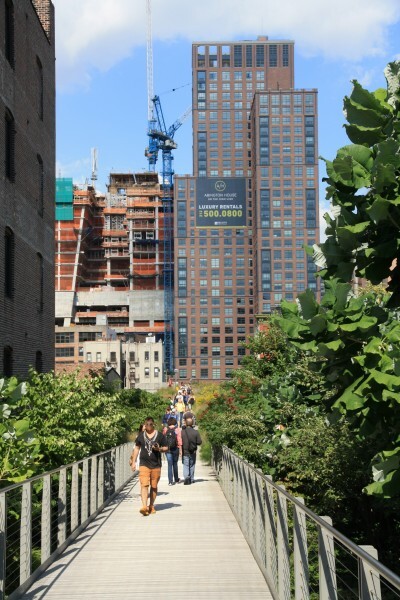 Residential towers will eventually rise above greenery planted on decking over the rail yards, transforming the High Line from a substantial presence to a tiny thread girdling high rises. It chastely separates itself from the real-estate profanity with a five-foot gap. The carefully curated path is actually a teaser, ending only a few hundred feet from where it started. 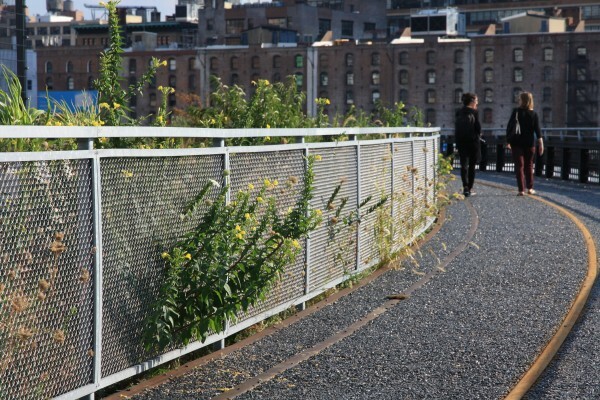 Until additional cash is raised (and until the true effect of Hudson Yards is understood), you will stroll along a functional crushed-gravel path for most of the loop, with what’s left of the naturally occurring High Line planting struggling to free itself by poking through a temporary fence. Plants grow through temporary fencing along the High Line Park. This stretch is far less showy, though it brings the river close and opens to reveal the jagged silhouette of downtown towers. I think many visitors will find it dull, and turn back. (It may become the only truly contemplative stretch of the park.) Concrete lumps that look like ruined chunks of the viaduct turn out to be savvy artworks by Argentine artist Adrián Villar Rojas, with the ironic (I hope) title, “The Evolution of God.” Sun, rain, and colonizing plants are expected to considerably erode them over a year. The scruffy beauty of this lightly edited version of the park reveals why the derelict High Line felt so wondrous in the first place (here accompanied by the low hum of parked Long Island Railroad trains). Like the rest of the High Line, it offers views with surprising juxtapositions. 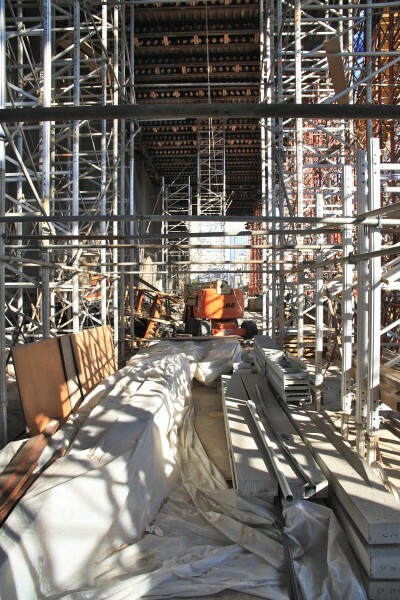 It also displays the degree to which the new High Line is a product of brilliantly conceived but painstaking artifice. And to think all those developers opposed the High Line and wanted the rail line down!! Why is it they always get to cash in on the things citizens stopped them from demolishing? Roberta, you are far too brilliantly tuned to the ironies of life in the big city. Thanks for writing! hamishe ye jooraei mofanefter boodam az roozaei ke migzasht ama hamishe ham nesbat beshoon ye hese gharib dashtam va moddatie be sheddat deltange oon roozaii hastam ke gozasht…man ham havas kardam,havas kardam baraye aan roozha esmi begozaram be pakie barf va arameshe baran…ahvalatet chetore refigh?! What do you use click here swirl remover and finishing options. Alright we are going to come show it off easily.